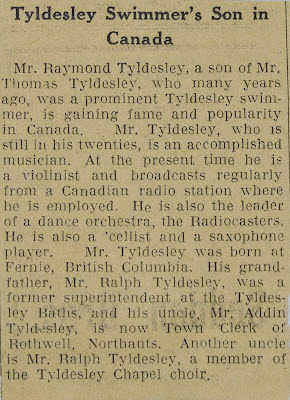 Mr. Raymond Tyldesley, a son of Mr. Thomas Tyldesley, who many years ago, was a prominent Tyldesley swimmer, is gaining fame and popularity in Canada. Mr. Tyldesley, who is still in his twenties, is an accomplished musician. At the present time he is a violinist and broadcasts regularly from a Canadian radio station where he is employed. He is also the leader of a dance orchestra, the Radiocasters. He is also a 'cellist and a saxophone player. 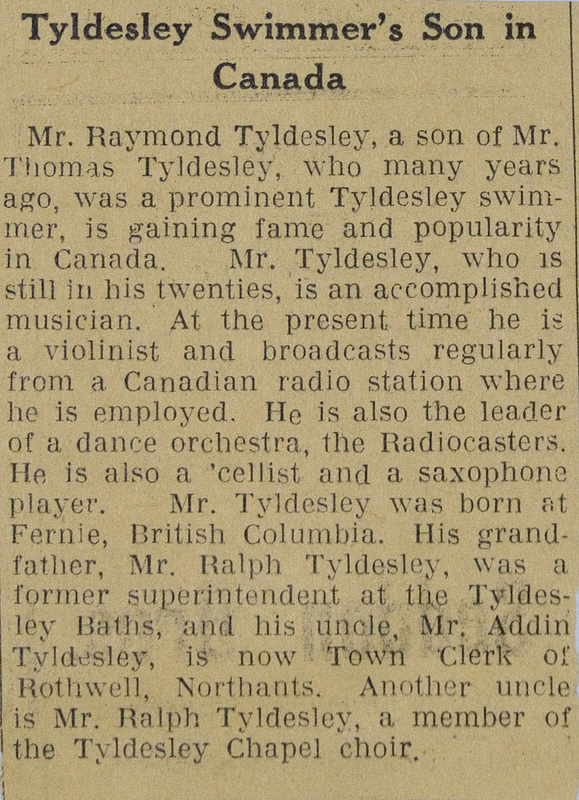 Mr. Tyldesley was born at Fernie, British Columbia. His grandfather, Mr. Ralph Tyldesley, was a former superintendent at the Tyldesley Baths, and his uncle, Mr. Addin Tyldesley, is now Town Clerk of Rothwell, Northants. Another uncle is Mr. Ralph Tyldesley, a member of the Tyldesley Chapel choir.